If you decide to place a VoIP SIP gateway in Costa Rica, consider the offers of local operators and select the optimal prepaid package. The cheaper the outgoing calls are, the more you can earn terminating traffic. 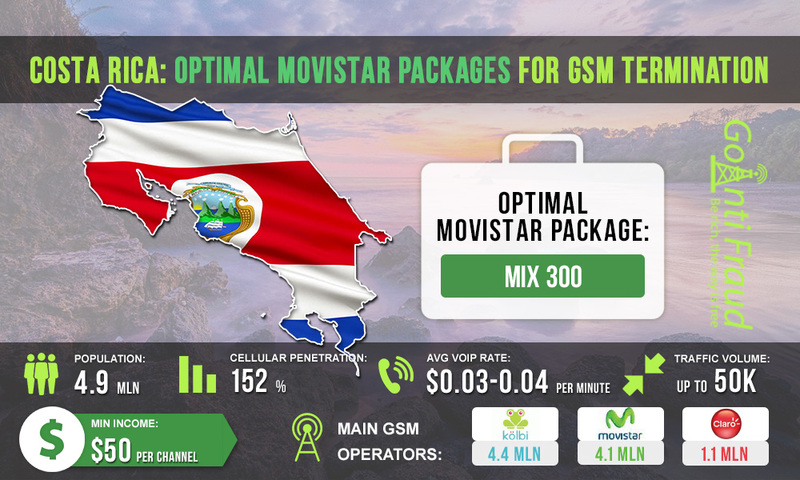 Movistar is the second largest operator of Costa Rica as over 4.1 million people use its services. After you have selected an advantageous tariff plan, you can begin to terminate. The operator covers 70% of the country. It is believed that this is the best network in Costa Rica in terms of coverage and data rate. The cost of a Movistar SIM-card varies from $1.7 to $4.4. The operator offers various prepaid packages that are focused on voice services, SMS-services, international calls, and Internet access services. Prepago Voz Local. For $5.35, the subscriber gets 120 minutes for local calls within the Movistar network. Mix 150. It is a mixed package, which provides 50 bonus minutes for calls at $0.27 in addition to Internet data and SMS. Mix 300. This is also a mixed package but it provides 100 minutes at $0.54 for voice services. The optimal package for voice termination is Mix 300. Using it, one minute of the local call will cost as little as $0.005. VoIP rates in the direction of Costa Rica are $0.03-$0.04. Terminating 5 hours a day via Mix 300, the terminator will be able to make about $100 from 1 channel of the GSM gateway. You can also install multi-channel equipment to increase your income exponentially.